The hell of the Second World War meant that during the years between 1942 and 1945, the Spartan Cricket Club was on hiatus. With no organised competition or players (many of whom were away fighting on the front line), it was certainly the most difficult challenge the Club has had to overcome to continue operation. At the conclusion of organised competition, the Club was playing in the Fremantle & Districts Mercantile Cricket Association, where it would return following the completion of the War. It would however, be almost a decade for the association (which also resumed following the War’s end) to garner the clubs, players, and successes of its glory days. 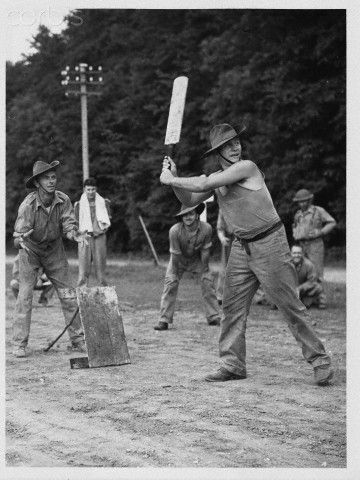 Australians playing cricket during WW2. The final season of the FDMCA, and therefore, the Spartan Cricket Club, concluded in early 1942, and it was not until 1945/46 did cricket re-emerge. In fact, the last shot had barely been fired before cricket was once again in full swing in the Fremantle area, and with the return of the fine men serving overseas, the Spartan Cricket Club was reborn. Despite the quick re-emergence, the competition’s end in 1942 was just prior to the Japanese bombing of Darwin on 19th February of that year, and the impact of that horrendous attack cemented the fact that it would be many years before cricket’s return. As one would imagine, Darwin’s bombing – an attack on Australian soil – sunk fear into the hearts and minds of many, and the thought of playing the game of cricket was almost impossible to comprehend. Unimaginable horrors of World War Two – from the first of September 1939 to the second of September 1945 – had had a profound impact on the Spartan Cricket Club, despite the fact that there was very little cricket played during this period. The years leading up to the Second World War, which began on September 1st, 1939, were highlighted by the impact of the Great Depression. This caused many familiar faces to miss seasons, or parts thereof, in the desperate search for work and income. This impacted the Club in a variety of different ways, with opposition clubs disappearing, and the performances of the era hampered by a lack of appearances. It is no surprise then, that the statistics of the period were unable to reach their true heights. Of significance, this also marked a change in the colours of the Club, which were previously blue and gold, as taken from the Sussex Cricket Club in England. Following completion of the War, and rebirth of the Club, the colours were changed to a more appropriate Spartan feel of red and navy blue. The Club was fortunate to have a close relationship with the FDMCA, particularly due to the fact that the association was operated by a number of Spartans. Albert West (pictured left) served as FDMCA Secretary from 1919 until 1956 (in addition to being the secretary of Essandee Cricket Club from 1919 to 1942), and as President of Spartans from 1945 to 1959. He kept all the records of the association and the early post-war years of the Spartan Cricket Club in a tin trunk. Unfortunately however, when the trunk was presented to Spartan President Brian Waterer in 1965, it was discovered that termites had destroyed the contents. The Fremantle & Districts Mercantile Cricket Association was reformed after the conclusion of World War Two in 1945, where it existed until May 1996. The Spartan Cricket Club, by then known as it is today as the Leeming Spartan Cricket Club, played every season in the FDMCA thereafter. 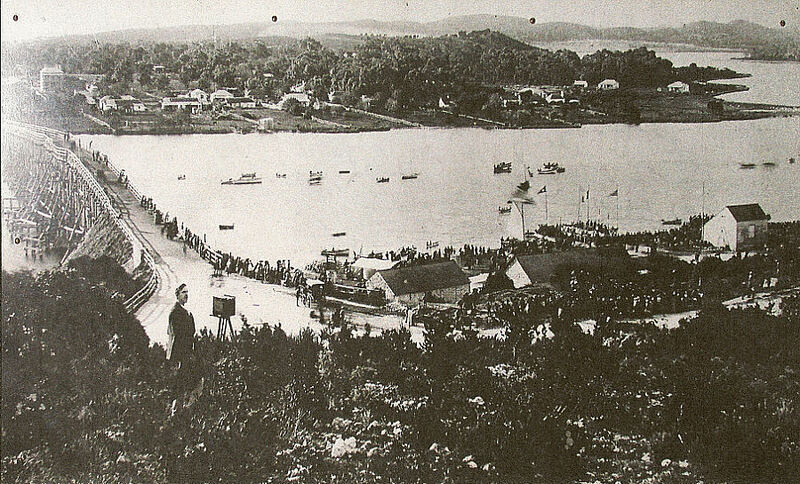 With the War having now been fought for more than two years, it was becoming increasingly challenging for organised competitions to take place. By this stage, the Second World War had been gradually pushing sporting competitions into the background, and as a result, those competing in the FDMCA had fallen away to just six clubs (including the Spartan Cricket Club). As such, the success of the Club during the lead up to the hiatus was impeded by the fact that at the time, we did not have a home ground, meaning that all congregation between members following completion of matches was typically held at the facilities on Fremantle Park, home of the FDMCA. The 1941/42 season was the final season the Spartan Cricket Club played before the hiatus brought on by the Second World War. The years of 1941 and 1942 were without doubt, a struggle, with depreciating numbers of players, opposition teams folding, and a lack of grounds due to their uses for War preparations. It seemed increasingly unlikely that the Club would continue to operate. The bombing of Port Moresby in New Guinea (now Papua New Guinea) by the Japanese had Australians on high alert about a possible invasion, and these fears were exacerbated by the attack on Darwin later that month. Furthermore, a surprise raid on Broome, Western Australia, left nearly 100 casualties, and was the first time the state had been attacked in an act of war by a foreign nation. The war in the Pacific and the threat of Japan meant Australia’s involvement in the War would only continue to grow as the years went on, and as such, there was simply no time for cricket. This was a sentiment echoed by the many men of the era, many of whom deemed it inappropriate to be enjoying and partaking in sport during a time of global horror. Furthermore, Fremantle Park, home of the association, and the main location for matches, was to be covered with obstacles to prevent enemy aircraft from landing on it in the eventuality that Australia was invaded, such was the fear of the Japanese threat. Thus, following a particularly cold 1941 Christmas, the captains met at Fremantle Park (home of the FDMCA) and decided to suspend the competition until the cessation of hostilities. The covering of Fremantle Park was detrimental in the postponement of the Spartan Cricket Club’s operation. Despite never having had a permanent home ground, Fremantle Park could almost be considered as such. Similarly, the Church Hall on High Street, Fremantle, served as a clubroom of sorts, although due to its use for a variety of functions, it certainly couldn’t be considered as such. There wasn’t the option to display any memorabilia, photographs, or historical items, and really only served as a location for post match festivities, in addition to the rooms at Fremantle Park. The oval’s closure was the final nail in the coffin for the end of pre-war cricket in the FDMCA. Since its inception in 1918, the Club since had always had the Church of Christ in Fremantle as its parent figure, being formed by the Reverend Hibbert as part of the Churches Cricket Association. So ended the first stage in the Club’s history. It is incredible to think then, that this era, which began with the Church, ended in the complete opposite fashion, with the hell and atrocities of the Second World War. Looking over the river Swan from the Fremantle Bridge, Western Australia, 1942. Australia entered World War II shortly after the invasion of Poland, declaring war on Germany on September 3rd, 1939. Australia, a dominion of the British Empire, followed the ‘mother country’ into battle. By the end of the war, almost a million Australians had served in the armed forces, whose military units fought primarily in the European theatre, North African campaign, and the South West Pacific theatre. In addition, Australia came under direct attack for the first time in its post-colonial history, as mentioned above with the Bombing of Darwin and later Broome. Its casualties from enemy action during the war were over 27,000 killed and 23,477 wounded. The battles fought by Australian troops, although not directly related to the history of the Club, served as a core reason for its re-emergence following the War’s conclusion. In effect, Australia fought two wars between 1939 and 1945 – one against Germany and Italy as part of the British Commonwealth‘s war effort, and the other against Japan in alliance with the United States in the Pacific. For the Australian people, the horrorendous acts committed by the Germans were literally half a world away, but the threat Japan posed was one on the nation’s doorstep, and this sped up Australian efforts towards defending their country. While most Australian forces were withdrawn from the Mediterranean following the outbreak of war in the Pacific, they continued to take part in large numbers in the air offensive against Germany. From 1942 until early 1944, Australian forces played a key role in the Pacific War, making up the majority of Allied strength throughout much of the fighting in the South West Pacific. This was the most significant reason that the Spartan Cricket Club could not continue to operate. The Club and FDMCA had held on for as long as they could, having continued to compete when the war first began in 1939. They played for a further two years before the Japanese threat rendered it impossible to continue playing cricket. Unfortunately, it is not know the personal exploits of the many Spartans who fought in the War, and those who sadly did not return at its conclusion. It is known that a number of Spartans returned to the Club in 1945, including captain Ian Mclumpha and opening bowler George Prince. Germany surrendered unconditionally to the Allies in France on May 7th, 1945. This left the War in the Pacific as the final significant component of the Second World War, and as such Australia’s final major involvement. Front page of Perth’s The Daily News on Tuesday, August 7th, 1945, announcing the atomic bombing of Hiroshima, Japan. The newspaper operated until 1990. On the morning of August 6th, 1945, the United States dropped the ‘Little-Boy’ nuclear bomb over Hiroshima, Japan, killing 70,000 people. A further nuclear bomb (the ‘Fat-Man’) was dropped three days later on the city of Nagasaki, killing 39,000 people, including 27,778 Japanese munitions employees, 2,000 Korean slave laborers, and 150 Japanese combatants. In total, around 119,000 people were killed in these bombings. Japan surrendered on August 14th, and formally on September 2nd, 1945. All major operations comprising the Second World War have now finally concluded. 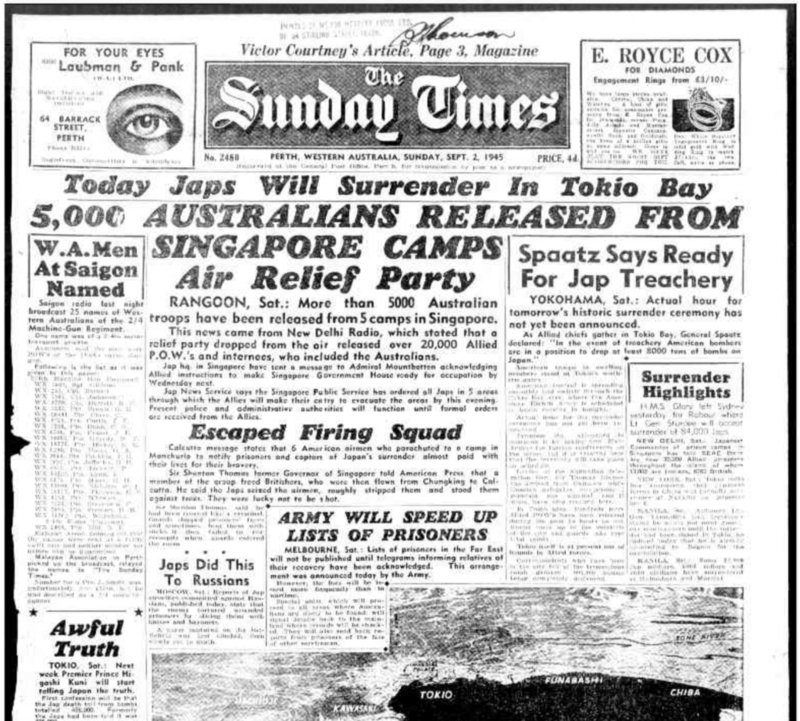 RANGOON, Sat: More than 5000 Australian troops have been released from 5 camps in Singapore. This news came from New Delhi Radio, which stated that a relief party dropped from the air released over 20,000 Allied P.O.W.’s and internees, who included the Australians. Jap h.q. in Singapore have sent a message to Admiral Mountbatten acknowledging Allied instructions to make Singapore Government House ready for occupation by Wednesday next. The conclusion of the Second World War meant the reintroduction of the Spartan Cricket Club in August 1945. Two very fine cricket stalwarts in Albert West and Jack Knox-Peden joined forces to get things underway. West, having been secretary of the FDMCA arrived at the Spartan Cricket Club from Essandee Cricket Club, and Knox-Peden, formerly of the Navy Club (also playing in the FDMCA), served as the first two Presidents of this post-war era. These two men were responsible for reforming the Spartan Club, re-constituting the Fremantle Districts Mercantile Cricket Association, (now shortened as F&DMCA), and founding The West Australian Cricket Union (WACU) – a union of all the district competitions in the Metropolitan areas in Western Australia. The WACU provided the framework for inter-association matches and state games at that level against Victorian and New South Wales sub-district associations. Furthermore, the Church was no longer involved in the Club’s organisation, and this naturally led to a change in outlook and personnel. With a number of returning members and new faces, the Spartan Cricket Club (once more a single-sided organisation) looked strong on paper, but the playing results did not match the promise, and so the years between 1945 and 1949 were not all that successful with the Club finishing in sixth place in all of those seasons respectively. Unfortunately, there is not a great deal of information known about the resurrection of the Club in the immediate years following the end of World War Two, due to the effects of time and the fact that the efforts involved in re-establishing the Club left little time to record information. 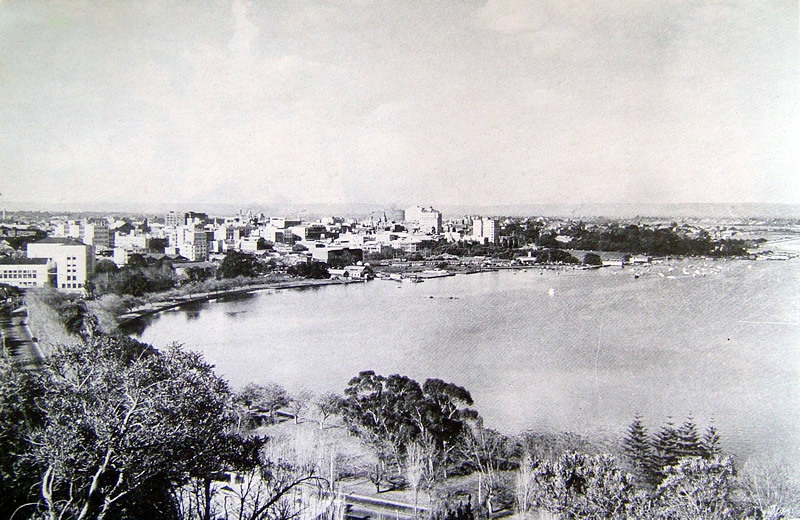 Perth City in 1945. 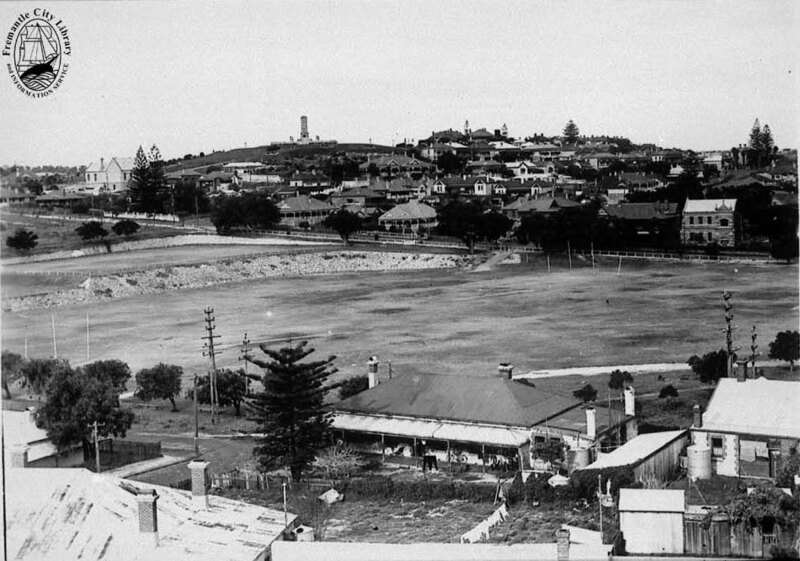 This photo shows where the CBD sits today, and was taken from Kings Park. Regrettably, the exploits of the members of the Spartan Cricket Club during wartime are largely unknown. We will endeavour to update this section of our War Year’s history as new information comes to light. Much of the information from the period is stored at the J.S. Battye Library of Western Australia. 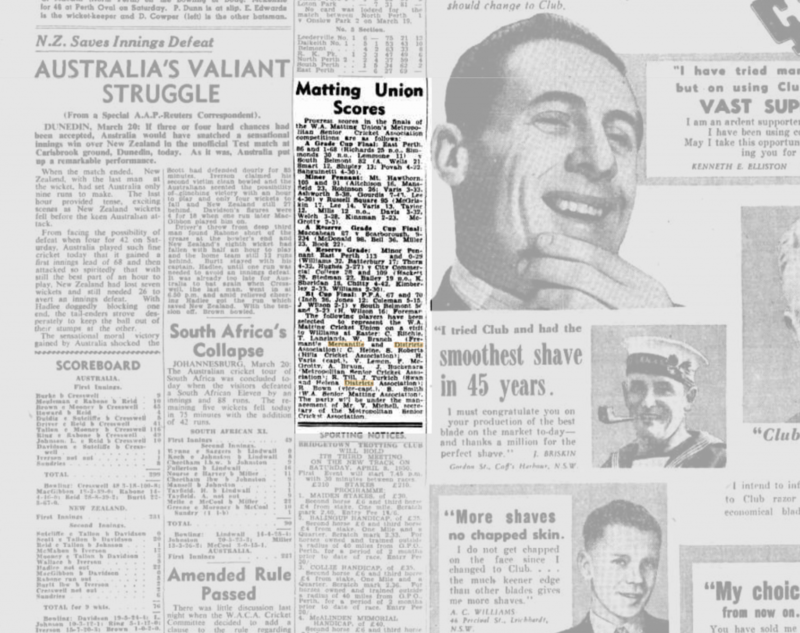 It is known however, that there were many members of the Fremantle Mercantile & Districts Cricket Association whom fought in the War, and as the article to the left from The West Australian indicates, there were certainly those who did not return. 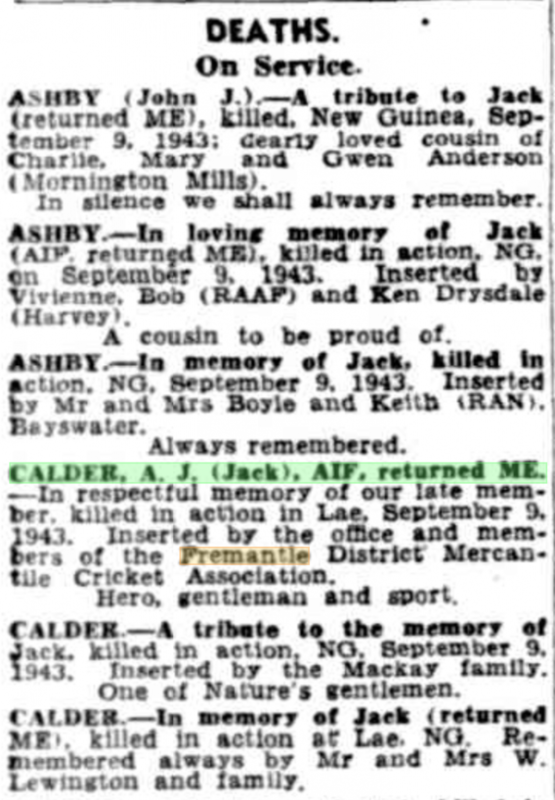 The FDMCA’s own Jack Calder of the Second Australian Imperial Force, was killed on September 9th, 1943 fighting against the Japanese in Lae, New Guinea. “CALDER, A. J. (Jack). Al, returned ME. – In respectful memory of our late member. killed in action in Lae. September 9, 1943. Inserted by the office and members of the Fremantle District’ Mercantile Cricket Association. Anyone who has any further information regarding the exports of the Spartan Cricket Club’s members during the Second World War is urged to contact us via Email at enquiries@nullspartans.com.au or via mobile on 0438 005 493. Albert West became the first person to be inducted as a Life Member of the Spartan Cricket Club, in 1950, for his mammoth efforts in resurrecting the Club and the FDMCA following the War. In 1918, the Church of Christ in Fremantle was the most significant factor in the foundation of the Club and was also responsible for establishing the Churches Cricket Association competition, in which the Club found itself. However, their influence had become increasingly limited once the Club was able to stand on its feet, and certainly, in 1945, there was no such institution to aid in the rebirth of the Spartans. It was therefore up to West, and Jack Knox-Peden (our fourth inductee as a Life Member in 1962) to ensure the Club re-emerged from the War. World War Two was without doubt the most significant threat the Club has faced since its inception in 1918 to remain operational, and thanks to the efforts of West and Knox-Peden, we emerged without incident. 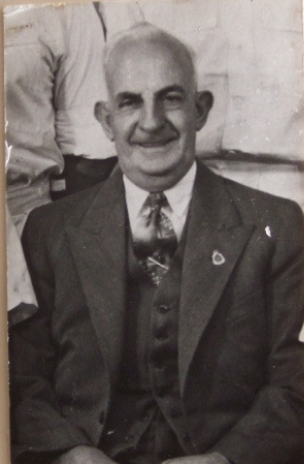 West was the perfect man to take on the role of President in 1946 (the year of 1945 did not have someone at the helm as efforts were focussed strictly on getting the Club up and running again), replacing the former Mayor of East Fremantle (1906-1909), Mr. S Thomson. West was only the third President of the Club (now in its 28th year), and served for over thirteen years, retiring in 1959. Of course, it was Knox-Peden who succeeded West in the top job, spending almost two decades as leader of the Spartan Cricket Club, before his retirement in 1978. The efforts of these two stalwarts is the most significant reason as to why the Club was able to survive the horrors of the Second World War. “The following players have been selected to’ represent the W.A. Matting Cricket Union on a visit to Williams at Easter: C. Ritchie, T. Langlands, W. Branch (Fremantle Mercantile and Districts Association)… The party will be under the management of Mr. V. Michell, secretary of the Metropolitan Senior Cricket Association.” Taken from The West Australian, 21st March, 1950.